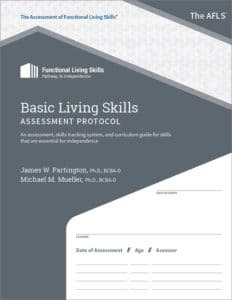 The authors used their extensive professional and clinical experience as well as the science of applied behavior analysis to identify the six areas critical to the development of functional living skills. Once identified, they were able to transform these areas into individual assessment protocols – creating the pathway for successful outcomes. As part of the development, the authors surveyed professionals, teachers, parents, and others to define specific skills and skill subsets. The authors observed a variety of programs and individual clients (and families) which assisted them in gaining further knowledge and understanding of development of functional living skills spanning early childhood, adolescents, and adulthood. In addition, focus groups reviewed and provided input regarding the order of skills as well as for relevance and rate of acquisition. These groups used the AFLS system and assisted the authors in creating this dynamic tool that results in positive outcomes for all. Children with a diagnosis of autism frequently have major deficits in their ability to perform a wide range of skills necessary for routine daily activities. These deficits in functional living skills often limit the individual’s options to participate in many family and community activities. 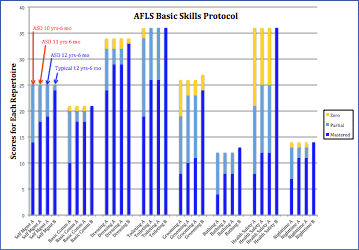 The AFLS system provides its users with the ability to create meaningful and successful programs that guide any individual to successful skills acquisition. While we focus on specific disabilities below it can be used with all populations regardless of their personal situation.